I’m not much of a detailed reviewer, so I’ll go ahead leave these open for the other members to add to if they find certain aspects of the game different than me. If they add something it’ll be in a different section signed by them. That way you can see the games from different view points, and from those views you can see who you relate to most and then choose games based off each reviewer. In other words, see which reviewer has the most in common with you and follow their advice. I’ve been playing this game for a bit, a fighting game called BlazBlue. Let me first say that if you are a sucker for anime and fighting, buy this… NOW! The fighting mechanics of this game are absolutely amazing. 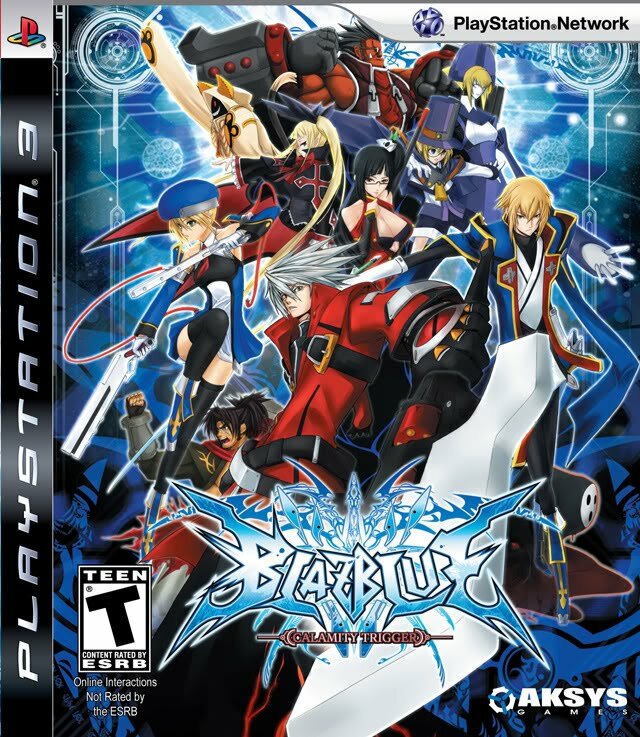 If you’ve ever played Guilty Gear, it’s similar to that, but so much better. It has several modes of gameplay including Arcade, Story, and Score Attack. It’s what you’d expect from an Aksys fighter, with even more. It’s a fighting game that is only possible in dreams, but actually exists. You like unlocking things in games…? Well, then this game is for you. Unlockables include art for the gallery, playing through the arcade unlocks your finishing blow (astral heat) for each character, and there are also two characters to unlock through story mode. Then if you want, unlockable fights through the Score Attack mode.The game has an abundant amount of content, more than any fighting fan could ask for; not to mention the diversity among each character. This isn’t Street Fighter in the aspect that there are maybe 3 or 4 character styles, then the rest fight with slight variations. Oh no, this has 12 varying characters, each with very unique styles and advantages. Stylisticly, it’s a gorgeous game. So clean and fluid, it blows my mind. And the online multiplier, aside from the initial introductions, there is no lag. Seriously, no lag. It’s fantastic. And totally off topic from the game, but they took the time to make cool trophy icons. Honestly, the art doesn’t skimp anywhere. Oh, and the story mode… It has a story. Not just “hey you, I don’t like you” *Round 1*… No, this has a back story for each character, after each battle it has dialog, you follow the character through a plot… there is a reason you fight each person. Only down side is that the game is a bit difficult to get a handle on because it is so different… So it does take a lot of practice. However, if you’re lucky enough to get a limited edition of the game, you’ll be blessed with the bluray/dvd which gives tutorials on each character and tips on how to use them.